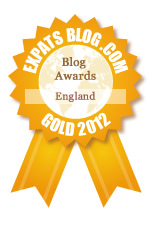 ExpatsBlog.com Expat Blog Awards 2012: England Gold Award! This blog won the Gold Award for best expat blog in England! 5 stars ! love her style, and she's super friendly, finger crossed britishette! I love Britishette's blog! I love her style and sense of humor and unique take on the everyday life of a stylish, jet setting, tech savvy mom living in London. She inspires me. I really like the travel posts on Britishette - she always has awesome photos. Keep up the good work! Britishette is fashion-forward, an awesome mom, always has great tips for London activities (with bonus Parisian ones!) AND she lives within walking distance of Emirates Stadium! What's not to love?? I always enjoy reading her posts. Love to follow Jo and baby Stella on their adventures! Can't wait to meet the new addition to the family through this lovely blog. Love BritishetteÂ´s blog on what the world like from travel to fashion to kids and other adventures! The pics are a great visual diary of what she has been up to! Too much fun following this Mummy! I just love that blog !!! Britishette just has to WIN... simply because she's the BEST!!! Great blog, nice pictures, ideas, comments on how to be a fashionable wife, woman and mum in London! I love Britishette's spirit ! We really feel close to the family and their life in London... Very incentive to spend time in London. Just carry on ! What every French girl in London needs to know! Full of sense and sensibility, funny and reliable and above all tremendously helpful ! keep on . London as its best from a different point of view. Great blog ! Britishette has to win ! ! Her sharp sense of humor, her insights on London's trends and travels around the world, her positive energy and fantastic story telling makes this blog a pleasure to read and follow every week. since reading this blog i feel ive gained a real insight into london through the eyes of a recent foreigner. As an expatriot who came to london 12 years ago i find this new perspective has helped me connect differently with london again. She definitely deserves to win. I love Britishette's blog. Always fun to read about her London adventures ! Not feeling good today? Need something to cheer you up? Try britishette.com I love the blog and its positive vibes; thanks Jo and a way to go mommy! I love britishetteÂ´s blog!For me it is interesting to read about everydayÂ´s life.I like the photos too and I want to give 5 stars. Keep it up. Great work, nice photowork and very enjoyable read! Thumbs up! Great and informative blog. She definitely deserves to win! Fab blog, real insight into London and fashion. Good to see a mum can be adventurous and inspiring in this way. always a good read - keep calm and carry on supporting Britishette! Britishette's blog makes me want to go back to London! Love to follow her funny adventures! I enjoy reading Britishette's blog. It's a great insight on family Life in London and expat life in England! Love her fresh perspective on London for moms and kids. 5 stars for all the scoops on activities, and for the London Walls series. What would I do without Britishette? Her blog is so current and fun I love it! I get my fix on London and British lifestyle every week with Britishette. Tons of fun! I just love her blog, her pictures are beautiful and she's so sophisticated ! This is one of my wife's favourite blogs and now I enjoy it too. Some great tips on how to spoil my pregnant wife!